At Borderway Agri Expo 2013, held on Friday 1st November, John Hall, of Inglewood Edge, Dalston, near Penrith was awarded the prestigious Blamire Prize. John and his family are one of the region’s most renowned breeders and certainly no strangers to Borderway Agri-Expo. Since its inception they have won overall champion, and last year they were winners in the Beltex Cross and Texel Crosse classes, going on to win reserve overall Champion with a pair of Dutch Texel Lambs. Martyn Mawson, a Blamire trustee and the winner John Hall. Each year, the prestigious Blamire Award, a monogrammed coin-like medal, is presented to people who are directly involved in agriculture in the old county of Cumberland. John has been 100% committed to working as an ambassador for Cumbrian Farmers his entire life, and this accolade is a tribute from the Cumbrian Agricultural Community to his dedication. 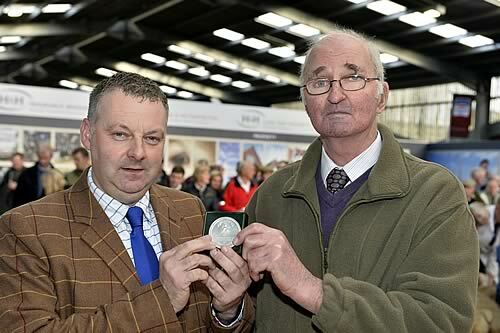 In a special presentation, John received the medal after the judging of the sheep classes. He was presented with his medal by Martyn Mawson, a Blamire Trustee from Bassenthwaite near Keswick. Farming at Inglewood Edge is family farming partnership made up of five generations. It is a traditional upland mixed farm in the region of 900 acres with suckler cows and breeding sheep. John and his brother Peter took over the farm at Dalston in 1949. At Agri-Expo this year John and his family were showing in a number of classes including pairs of lambs in the under 40 kilo and over 40 kilo classes. Demonstrating the commitment from the entire family, his two prizewinning granddaughters now in the business, will be showing a pair of lambs in the Young Farmers’ class. The Trust award this prize to people they feel who have gone beyond the call of duty and gone out of their way to do as much as they can for the agricultural community. The Trustees are all local farmers and this is their way of recognising the exceptional efforts of those in their own industry.